Copycat Zuppa Toscana soup recipe – as good as Olive Garden’s with spicy Italian sausage, bacon, cream, and kale. Pair with crusty bread and it’s a hearty meal! We don’t eat out very often. When we do, we usually support local restaurants. We have our favorites and sometimes it is nice to let someone else do the cooking:) I don’t like chain restaurants or fast food-sometimes I wonder if they even serve real food:) So when we were eating at our friends house the other night and they told us we were having the “Olive Garden’s soup”, I had no clue what they were talking about! 🙂 Sure, I have been to the Olive Garden, but it has been many, many years. Josh was craving the soup the other night-I was scared he was going to drag me to the Olive Garden, but instead he wanted to make it. Whew! 🙂 Josh bought all of the ingredients and made a big pot of Zuppa Tuscana at home. He was pleased with his soup-he said it really hit the spot! 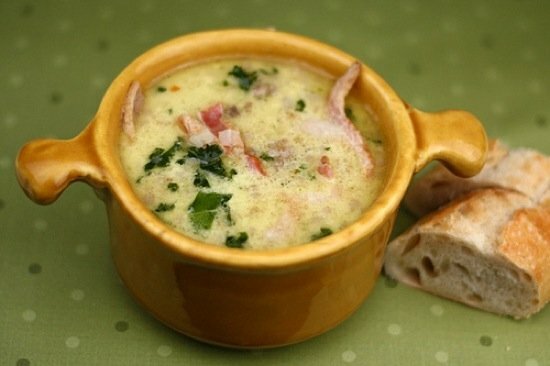 Josh highly recommends eating Zuppa Toscana with good, crusty bread. He likes to dunk the bread in the soup. He loves the robust flavors and big meat chunks. 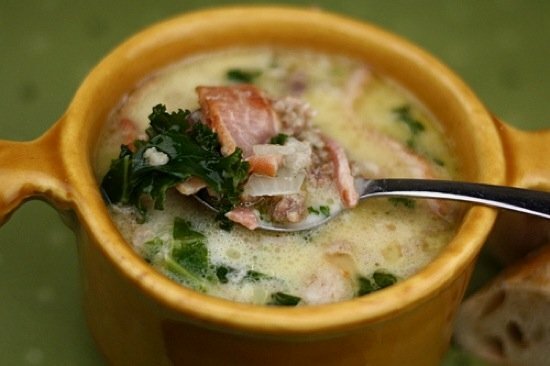 If you love the Olive Garden’s Zuppa Toscana soup, try making it at home. I am sure it’s even better than the real deal! *And if you love the Olive Garden-I am glad, it is just not my “cup of tea.” 🙂 No hard feelings..ha! Maria, that soup does look like liquid comfort. I don’t eat out as often as I used to but when I do, I sometimes find inspiration as you have done here. 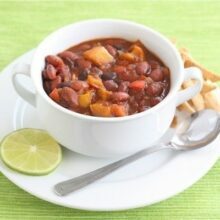 A very flavorful and satisfying soup! Ben loves the Olive Garden! I’ll have to show him this! I’m so with you! I am much more of a local restaurant kind of gal! I bet my Josh would love this soup too. Looks like a very manly soup 😉 Hope you’re doing well. I haven’t been to Olive Garden in a while but I think this was what a had last time I was there. It is a yummy soup and as far as chains go, their soup and salad is hard to beat when in a hurry. This looks good. Glad to know it’s here for trying on our next soup night. I haven’t been to Olive Garden that many times (kind of obviously – we don’t have it here in Manila), but I like that they have some truly healthy options on the menu. This looks really good (and all the meat sounds nice too), I hope you were able to sequester a certain portion without meat for yourself..
what a comforting sounding soup maria. especially like the kale in there. i have a recipe with kale up at the moment – one of my fave leafy greens! That looks so incredible!! Love the bacon in it! First off I love your blog. Thanks for sharing all your wonderful recipes. My husband loves this soup as well and I have the same exact copy cat recipe and have been using it for years. We love it!!! I love taking dishes from restaurants and recreating them at home! This soup sounds fantastic – and I’m sure it’s much better made in your kitchen than at the Olive Garden! never been to olive garden, but this sounds so good! I make a great vegetarian version of this soup. I sub the sausage for the gimme lean soy sausage (don’t know if you eat that or not). I also sub the bacon for a little smoke flavoring (I don’t like the texture of the veggie bacon). Now you can make it for yourself, and my meat loving husband loves it too! I also add marjoram as a seasoning for the soup, it adds just the right flavor. Thanks for the great blog! I love this soup I have tried others versions I can’t wait to try this one so excited. My husband and I always go for soup and salad lately just for this soup yummy!!! Looks wonderful! Nice job, Josh. And it has the Olive Garden signature cream in it, hehe! I always get so mad at their commercials–every sauce is a cream sauce! Or the meat is stuffed with cheese. Or the cheese ravioli or cheese stuffed meat is drowned in a cream sauce and covered with more cheese. “Let’s make cheese, cover it in cream sauce, and top it with more cheese!” Hahaha! It definitely sounds like it would taste good! This sounds great, Maria (and Josh)! A very hearty and comforting soup. So glad you shared this recipe! We don’t eat out at chain restaurants anymore for the same reasons as you, but when I used to, I loved Olive Garden and always ordered this soup. Happy to be able to make it at home now. This is my absolute FAVORITE soup at Olive Garden. Not a huge fan of the place but I do love this soup paired with their yummy breadsticks. Can’t wait to try it at home! I love this soup at Olive Garden! Looks great, thanks for sharing. It has been years since I have gone to the Olive Garden but I should make this for my parents. My Dad would probably love this soup as it sounds delicious. I think I would make the veggie version though for myself as well. This looks like the perfect soup for a chilly night! I would much rather yours than the Olive Garden’s any day 🙂 This would be great after a big day of winter sports! Hearty and satisfying. I absolutely love this soup. It looks really good Maria! I love zuppa toscana and used to go to Olive Garden just for it. Ever since I figured out how to make it at home, I never go to the restaurant anymore. I agree with Josh – it’s hearty and really hits the spot on cold winter days. I don’t think I’ve ever been to Olive Garden before. The whole chain-restaurant thing just never appeals to me! The soup looks wonderful though! I have to admit, I’m not the biggest fan of the Olive Garden (if I’m gonna eat out, I’d prefer it not to be at a chain). but this soup looks too good to pass up. So creamy and delicious! I love this kind of soup, it sounds wonderful! We make a version of this soup quite often…it is so yummy, yours looks delicious! Heading out tomorrow to buy ingredients for this delicious looking soup! Am going to make a batch for my Dad since he’s always telllig me he “needs to eat more greens” Looks super yummy! I’m sure it will be a hit. Thanks for sharing! The best part of recreating restaurant faves at home is knowing exactly what goes into them. I haven’t been to an Olive Garden either, although I think we do have them in Canada. The soup looks delicious, very hearty. Oh, this looks so good! We used to have the Olive Garden here in Toronto but sadly they all closed. When we cross the boarder we usually try to make a stop. I’m going to make this for my hubby, who was very saddened by the chain’s Canadian demise. Sounds good, looks GREAT! I’ve already printed out the recipe though I’ll be swapping out the kale for spinach so I don’t have to swing by the grocery store. Thanks for passing along the recipe. We’re not much for eating out, either, but we are soup fans. This looks well worth a try! I haven’t been to Olive Garden since I was in high school, but this soup does look good. It’s probably better homemade! That soup looks pretty tasty! I know what you mean about chain restaurants… We eat at them once in a while (since there aren’t a lot of other good options around here in the middle of nowhere), but definitely not my preference. That looks deeeeelightful. I’ve actually never been to the Olive Garden either, tho some friends swear by the soup and breadsticks? 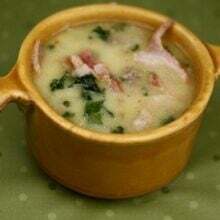 We make a similar White Bean Soup with Sausage and Kale, but bacon sounds like a wonderful addition… Will definitely have to try this! Olive Garden isn’t my cup of tea either. I admit I’m judging on strictly superficial criteria. I’ve never actually eaten in one and I’m just judging it because it’s a chain. But here in the NY suburbs, we have one of the highest cocentrations of Italian Americans in the US, so good Italian restaurants abound. I think the closest Olive Garden to my home is in NYC and mostly caters to tourists. I’m with ya girl..chains..ah not for me….they taste funky! !.But this soup looks lovely and great with fesh baked bread. My husband loves this soup at the Olive Garden. My son’s working there right now. I’ll have to give it a try! This is precisely the sort of hearty soup that would completely hit the spot on a day like today. It’s rainy and pea-soupy out — so something warming and nourishing, with all the good stuff (i.e. kale) would be just right. Oh yummy – and I LOVE kale! Hi, Maria! I just wanted to let you know that I made your soup this evening for dinner and all of us loved it. As I mentioned I didn’t use kale. It rained hard all day (we had severe thunderstorms and tornado warnings) and I didn’t want to have to stop at the grocery store for some. Next time I’ll give the kale a try. 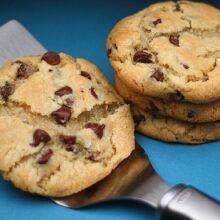 Thanks for passing along another yummy recipe. Ingrid-I am glad you enjoyed the soup. Thanks for letting us know. I am sure the spinach was great in it! Ah, this looks absolutely delicious! What a gorgeous soup which could be dinner for us. We love soup and I often just make soup for dinner with a good hearty bread! I haven’t had at the Olive Garden either, but people seem to love it. Your homemade version looks fantastic! This is my second favorite soup at Olive Garden! ( my first, minestrone). I will have to make this! miss you! Hey Guys, I made this soup for my Dad and he totally LOVES it. He asked me the name of it and when I told him, he said we needed to change it to “Damn Good Soup!” LOL He’s really enjoyed it. Thanks for sharing as always. Julie-Glad your dad loves this soup! This does look like a nice soup for meat lovers. Will have to give it a go and throw in some extra greens! I saw the “olive garden” in your post and thought OH NO. I’m so with you on chain restaurants,etc. This soup looks good, but really a bit heavy on the cream for my taste. If you notice those olive garden commercials, the food is so heavy and doesn’t look Italian to me. Now having said that, my husband dies for the sausage lentil from Carrabba’s and sometimes we get it as take out. (I need to make that from scratch, don’t I). Pretty much anything is better home made, so I’m sure this soup is too. Definitely looks good. I just finished eating my second bowl, you hit the nail on the head with this recipe. The nearest Olive Garden is about two hours away from my home. I always order this soup when I get a chance to go. Now that I can make it at home, I can satisfy my cravings more often. Thanks you did a good job! Made this soup last night – used turkey kielbasa instead of sausage – and it was SLAMMIN’!!!! Made your drop biscuits to go with – with cheddar cheese and scallions – and let me tell you, it was better than going out to eat! Made this for my book club today and it was SPOT ON perfect!! This soup is the reason I ever go to Olive Garden. It was exactly the same. My daughter even thought it was better. Family loved it. Book Clubbies loved it. Dreamy. Thanks!! 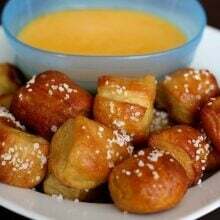 I had this soup last year at Olive Garden and have been looking for the recipe when I just found yours through stumbleupon! This recipe is fantastic! I made it with kielbasa and some extra potatoes and it is DELICIOUS! My parents loved it and want me to keep this recipe and it’s perfect for the rainy cold days we have had thanks again so much and I am bookmarking your site for the future! turned out fantastic! LOVED it.. If you’d like to try a REAL tuscan soup (and it’s vegetable one, no sausage, they don’t do that in tuscany. Trust me, I lived there for 5 loooong years) google ribollita. Absolutely fabulous! This looks delicious! Do you think spinach would be a good substitute for the kale? It’s kind of funny seeing the title written the way it is because two words are repeated. 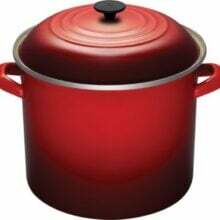 I just made a big pot of this soup! It came out excellent… my husband likes it even more than I do. We like to shake a ton of pepper on top before eating it and that makes this soup taste even better. Just made your soup, it was fantastic! thank you for the recipe =) just a warning to others – stay away from rainbow chard as a substitute for the kale… we ended up with strawberry milk-colored soup! Yesterday was our first chilly day in Texas this fall. Soup sounded like the perfect Sunday night dinner. I made this last night…it was soooooo good and flavorful!! Even my kids gobbled it up! Plenty for leftovers tonight! Surely, one of our favorites!! Mmmm, if you are a soupie like me, you MUST try this recipe. Definitely restaurant quality! I made this for dinner last night and I must say it got a big thumbs up from everyone. I used Italian chicken sausage (I had some in the freezer). It was my first time cooking with kale and it was very easy to prepare and use. I will be looking from some other recipes with kale. We also had the Mexican rice bowls this week. Thanks for two great recipes. Made this for dinner tonight, and it tastes so good. Thank you for sharing this recipe. I wonder how the kale would keep in a soup like this. Would I need to keep it separate until I am ready to reheat it or just leave it in there. Just seems like it would eventually get soggy like spinach does. This has become my favorite soup recipe!!!! Thanks so much for sharing! I’ve made your version several times – it’s soooo much better than even the original. I also Love that I can make it spicier or add spinach instead of kale if that’s what I have…. And it’s even better the next day or two!! How is this the same with no potatoes? Seems very different. I made this soup before I ever had it at Olive Garden. Then I went to Olive Garden and had it there. I have to say that this version is so much better!